Interns are expected to raise monthly support for their living and meal expenses. We can recommend resources that can lead you through this process. Health insurance is also a requirement. If you bring your own vehicle, you will need auto insurance coverage in Mexico before entering. 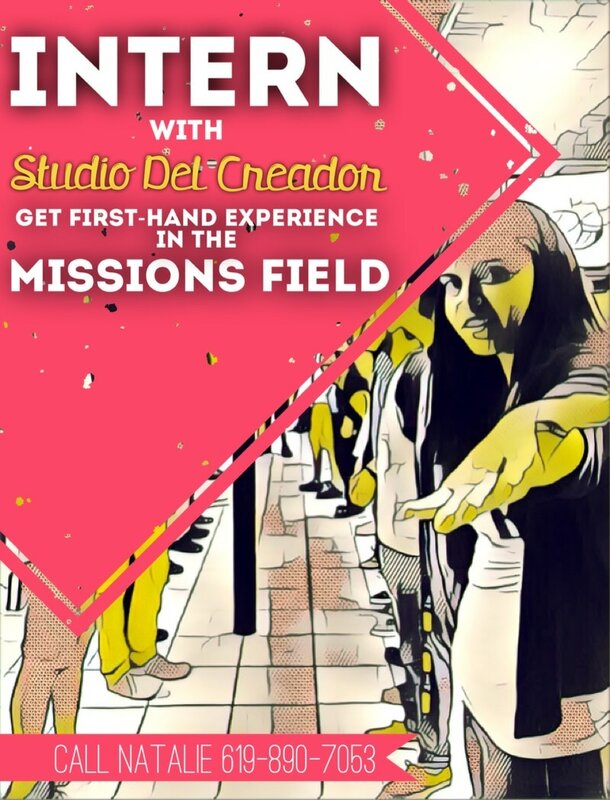 Contact Natalie at natalien@studiodelcreador.org for more information and an application. Intern with Studio Del Creador. "My first few years of serving in the missions field were fundamental in my growth and preparation for one day fulfilling my calling to start a ministry. The challenges were so intense that I had two choices: to either give-up, or to persevere. That is when I truly came to know Jesus as my Lord, my Strength, Protector, Provider, Comforter... I wouldn't have had it any other way." ​--founder of SDC, Natalie Nicholson-Lozano. This person will work alongside us, supervising our community art & music center, its programs, activities & events, as well as our team of volunteers. Not only will you have an amazing opportunity to grow, but you will have daily opportunity to help meet people's physical, emotional and spiritual needs. CHILDREN'S PROGRAM DIRECTOR. We currently offer our programs to youth over 12 years old, on through adulthood. However, there is great interest for us to open up classes for younger children. Thus, we are looking for someone to dedicate their efforts in starting and leading a morning art & music program for children. COFFEE STAND MANAGER. We are working on opening a local coffee shop to provide employment to church members and create a fountain of provision for the ministry. This person would manage the coffee shop: train & oversee employees/volunteers, keep track of inventory/shop, manage "the books", and help grow the business for the benefit of the ministry. SECRETARY. We are looking for a bilingual (in speech and writing) person who finds fulfillment in sitting at a desk and in front of a computer most of the day. This person will help with administrative assignments both in our local church and the art school. **Minimum age requirement is 18 years old. All positions require Spanish fluency. Talent/Experience is not necessary (but of course, is a plus!). We are looking for people with a servant's heart and teachable spirit who love Jesus before all else. Interested in interning with us? Get hands-on experience in the missions field & make a difference in many lives! Familiarize yourself with Studio Del Creador by reading through past newsletters and visiting our Facebook page. Also, check out the founder's blog www.desertgoldmine.weebly.com to read about what it is like to be a missionary with SDC. Pray and seek the Lord for definite confirmation of your call to serve with Studio Del Creador. Seek counsel of mature Christians who have had experience in the missions field, and have experienced the difficulties of severe cultural change. Study Spanish, and study it more. Take a short-term missions trip to Studio Del Creador. Prepare your faith for raising financial support. We recommend you seek a mentor who will walk alongside you in this process. Contact us for training material recommendation. Develop a team of intercessors who will pray for you on a regular basis. Email Natalie Nicholson-Lozano at: natalien@studiodelcreador.org for an application and to begin the interview process. *Must be at least 21 years old.